This download is a 2 page end-of-course survey for students to complete about the class to help you the teacher better understand how the year when and reflect on what to change for the next year. There are also 4 editable spaces for you or your students to add your additional class characteristics to rate. You can download this resource and use it for your class by clicking here! 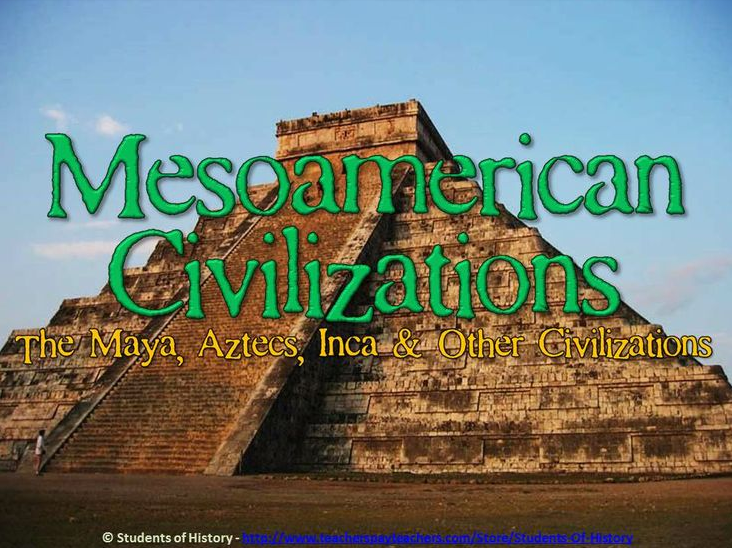 Brand New PowerPoint on the Maya, Aztec, Inca, and other Mesoamerican Civilizations! This is a fantastic, thorough, and visually-engaging 34-slide PowerPoint on the Maya, Aztec, Inca, and other Meso-american civilizations. Each pre-Columbian civilization is covered in detail, including where they were located, when they flourished, their contributions, and more. Each slide includes fantastic visuals that will engage your students and keep them focused on your lesson. 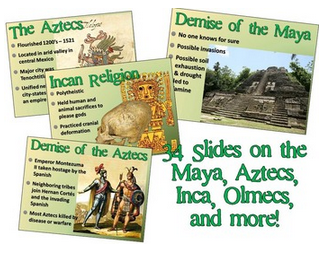 In addition to slides on the Mayans, Aztecs, and Inca, additional sides cover the Olmecs, Zapotecs, and Toltecs! This presentation is incredibly thorough and covered all the essential information your students need to know about these civilizations! This will definitely be a memorable PowerPoint presentation that will capture your students attention and help them understand the differences between these different civilizations. You can download this great resource by clicking here! Be sure to check out my store for tons more great history and social studies teaching resources! 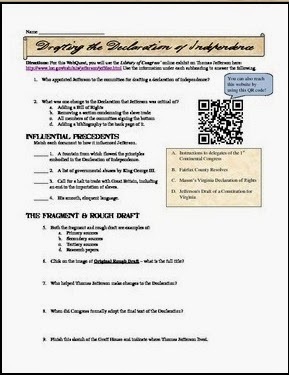 This newly posted resource a fantastic WebQuest activity in which students can either use a QR Code Reader or the internet to reach an online exhibit from the Library of Congress on Thomas Jefferson and the Declaration of Independence! After reaching the website exhibition, students use a 3-page worksheet to analyze primary sources on the influences and key ideas of the Declaration's rough draft and final document. This is an awesome resource to use in a computer lab, with iPads, laptops, or as a homework assignment students complete on their own. Students connect with the technology integration and are always more engaged in the activity! An answer key is even included for your convenience. You can download this for your classroom today by clicking here!